Championship Grands Prix, two Drivers' titles (for Jochen Rindt in 1970 and Emerson Fittipaldi in 1972) and three Constructors' titles (in 1970, 1972 and 1973), racing first in Lotus's evocative red, white and gold livery, then the equally eye-catching black and gold of the John Player Special period. Pete Lyons, Autosport's renowned Formula 1 reporter for part of the Lotus 72 era, explores the car's entire race-by-race career in his insightful commentary accompanying a magnificent array of more than 300 photos. The 1971 season: with promising youngster Emerson Fittipaldi elevated to team leader after Rindt's death, great things were expected of the 72's second season but it proved to be winless. 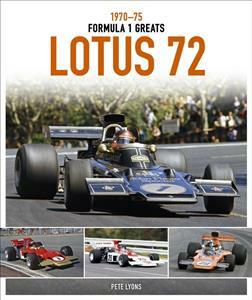 The 1972 season: now in black and gold John Player livery, the 72 became far more competitive and Fittipaldi's four Grand Prix victories made him World Champion. The 1973 season: Ronnie 'SuperSwede' Peterson joined Fittipaldi to form a dream team and together they won seven races, but because Lotus's spoils were divided between the two drivers Jackie Stewart was able to come through to become World Champion. The 1975 season: well beyond its sell-by date, the 72 did a final season but by now it was far from effective, with Ickx's second place in the tragic Spanish Grand Prix its best result.